Rather than include long sections of biographical material, with sourcing when necessary, their story is told almost exclusively in quotes. So there are countless quotes from the duo themselves, and many from their friends and associates in the music business. For some people this might be off-putting, but I enjoyed it because I actually know (or know of) most of the people, and in some cases could hear them saying it. In the case of one story from David Rea, about an attempt to arrest him for drug possession during a recording session in Toronto (a charge which was eventually dropped), I did really hear the story before, from David himself. There are two small photo sections; the first, from childhood through 1969; the second 1969 through 2010. In the latter section, there are two photos with Lightfoot; one from 1976 and the other from the Ian & Sylvia Reunion Concert in 1986 (a bit of that concert can be seen on You Tube). Unidentified, Lightfoot actually also appears in the first photo section, on the poster for the 1966 UK tour. Lightfoot himself is present throughout the book, not only in photos, but also contributing many quotes; and some of them say as much about him as about the subjects of the book. Just lift them up and put them in a new Lightfoot biography (one can wish). In the early years, their careers were inticately interwoven; and, no fewer than three of the musicians who backed Lightfoot also backed Ian & Sylvia: David Rea, and later Red Shea and Peewee Charles, both of whom appreciated the opportunity to work mostly in Toronto. Interestingly, there are no quotes from Peewee; if I get to speak with the author, that's one thing I will ask him about. Ian and Sylvia are icons in Canada where they have received most if not all of the awards that could be bestowed on them. Their influence on Canadian music is acknowleged; perhaps their influence on Country Rock is less acknowledged than it should be. They were playing it - much to the chagrin of some of their diehard fans - back when it was very new, and their music helped define the genre. Both went on to successful careers apart; Ian solo with "cowboy" music, having a very successful album with Cowboyography in 1987. Sylvia recorded a few solo albums and then joined with three musician friends to form the all-girl group Quartette. 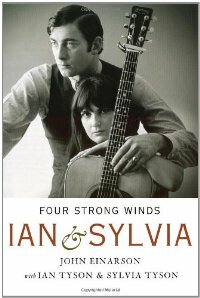 Both Ian and Sylvia are still active in music today. Their separate appearances at Mariposa 2010, and their reunion to perform Four Strong Winds - unrehearsed, and in fact only discussed by them minutes before Ian's solo set - close the book. I must admit that I cried a bit, and that I feel a bit sorry for them. They never received the high acclaim they deserve, at least in the US, probably because of Ian's decision to sign with Vanguard rather than with a more marketing savvy record label, like Columbia or Warner Brothers. Having placed Dylan, their manager Albert Grossman had almost infinite credibility in the world of record labels. Be that as it may, their contribution to the music of my youth, to Lightfoot's career (they recommended him to Grossman), and to the evolution of the genre is undisputed. But that "hit record" proved elusive. However, a hit is just for a moment in time, while their musical contributions will last many generations.